I kind of wished I had a photo of their stuff ready and loaded so all I would have to do is say, “I want that”. Instead I fumbled through the menu trying to figure out what looked like what I had seen on Instagram. (I know I should have just stopped and searched right there.) I asked a few questions, but ultimately the decision was up to me. I won’t lie, I really like it when they have an absolute favorite or their best of, just tell me and have me order that. Not on this day. So I just pointed and ordered. Even though it was noon we decided to order a beer because they had my favorite beer on tap, Pfreim Blonde IPA. I have no self control when I see that on tap. Now my husband had seen the sandwich special and decided he wanted to try that. It was made with Tails & Trotters Pork. You see there stuff all over town, so you know that has to be a great sandwich. 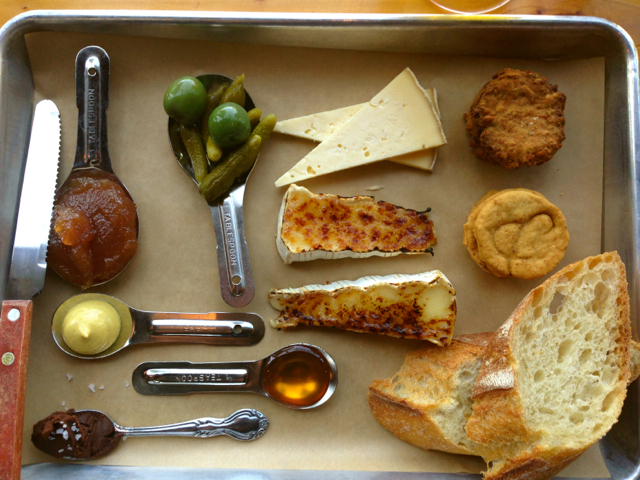 I was seriously so happy when my cheese plate arrived. They have completely nailed it with presentation. I had chose the Cascadia Cloud Cap and the Brie brûlée. As you can see there was a generous serving of cheese, which I appreciated. Because there were so many things on the plate I asked him if he would tell me what everything was. Yes, I know there were only 2 kinds of cheese, but what was the rest. He pointed out the cheeses and nothing else really. What I didn’t know is that one of the “cookie stacks” was actually crackers, but I didn’t realize that until the end of my meal after I had run out of bread. Nonetheless, I enjoyed my meal immensely. I tried all of it in all combinations possible. My husbands sandwich was delicious. 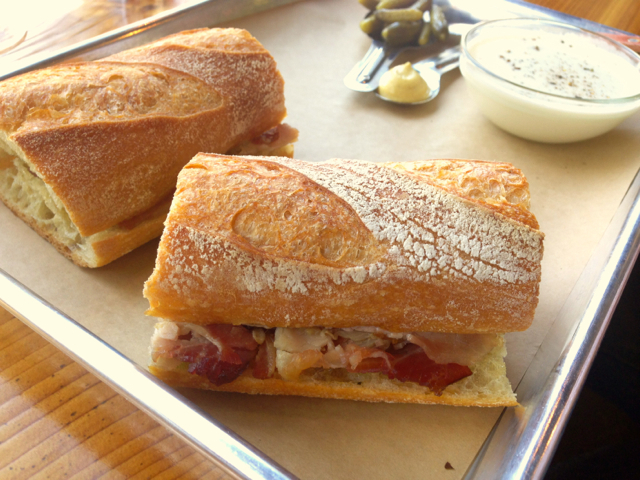 Tails and Trotters has great meat and Cheese and Crack created a perfect sandwich combination out of it. It might not look like much from the pictures, but it was fabulous. I almost wanted to order one myself. Next time I guess. Atmosphere is very minimalist and I loved it. The big sign on the wall with all the offerings was quite a statement in this little place. Pricing for all entrees was $6-$9. One entree was $11, so it’s priced really well. They did offer beer and wine. Cheese and Crack is located in SE Portland.